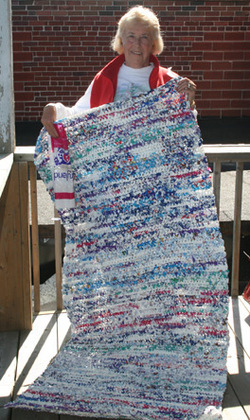 Below is a photo of Rita Kunc and she is holding a 6 feet long plastic sleeping mat, which she made for the homeless. She crocheted it in single crochet using plastic bags from milk. Plarn (plastic yarn) – Here is the tutorial: How to Make Plarn (Plastic Yarn). You will need lots of bags (too big of a number to even guess), so keep collecting them as you crochet your mat. Repeat row 3, until the mat is 6 feet long, then finish off. Creating one if these mats may take a long time! So be patient. Rita Kunc took about a year to make one! This entry was posted on Saturday, November 28th, 2009 at 1:23 PM by Rachel Choi	and is filed under Free Crochet Patterns, News. You can follow any responses to this entry through the RSS 2.0 feed. You can leave a response, or trackback from your own site. Can I just ask one question, as a confused Scottish person? You say that Rita made her plarn from plastic bags from milk…does milk come in bags in America?! It depends where you get it, I suppose. My milk doesn’t come in plastic bags. In Canada our milk comes in a bag that holds three pouches of milk. I don’t know why it couldn’t be made out of any kind of plastic like a grocery bag or even garbage bags. Perhaps she meant plastic grocery bags she uses to carry milk bottles. I’ve been plarning over the last year. Smaller projects don’t take so long, but I’ve managed to start a large shopping bag that is taking forever. The smaller project I have finished is a purse/flower carrier that consists of a circle with handles added at the end. I found that pattern on the internet, but I don’t have the link handy at the moment. I find dry cleaning bags helpful too as they produce a lot of yarn. I saw a group of church women doing this project. I hope to see if I can get a similar one started next year. If it’s anything like crocheting with vhs tapes, it will take awhile to complete. The green effort is well worth it though. Milk comes in bags, cartons and plastic jugs where I live (Southern Ontario, Canada). There is about a gallon of milk divided into three bags which are then placed in the larger bag and tied with a plastic tie (like a bread tie). She is crocheting with the outer bag. I like the idea, but any idea about where these can be donated? Union Mission in Charleston West Virginia. They minister to homeless men and women. I spent a week there in July on a mission trip from my church and they are amazing Christians doing amazing work. We saw some of the mats and our church is also going to be making them. Good project for the long cold winter months. Cami, I’m thinking of a homeless shelter in your area or contacting the Red Cross for guidance. If you know where the homeless migrate in your area, you could just deposit them where they could find them and use them. Just a thought. Of course nieghborhood churches may also direct you to shelters who could use them. I remember my grandmother using plastic bags or bread bags to make rugs for the kitchen. I asked her once if she would show me how and she hugged me and said that I shouldn’t ever have to make do the way she does because my life will be so different and here I am doing what she did not to necessarily be thrifty but to try and change my carbon footprint and recycle as much as possible. Where can you donate these? looks good , and fun too, but no point making it if it’ll collect dust in my closet. Glad I found this section on Crochet Spot! I have a large cardboard box crammed full of dry cleaner bags. (The moving van caught fire, so the moving company had all my clothing cleaned!) I could not bear to send them to the landfill. My idea was to make a mat to stand on at the kitchen sink. . .I want it to be cushy to stand on, so I may try making my mat without cutting them up. . .if I can figure that out! Keep the ideas posted! We have lots of work to do to save our open spaces on this planet. Hope this posts – All my posts come back with an address correction (but they were correct the first time) and when I go to retype – my message is missing – any ideas on what’s happenin and how to fix it? I’m anxious to try one of these – any idea what size hook to use? I’d think it was something large like P or Q. Another thought – why couldn’t a DC be used instead of SC? Since there is no skipping stitches, it should be as tightly croched as SC but the satisfaction of completion (I’m needy in this area) would be less than 1 year – I can’t imagine a project taking that long to complete. Hi Sodie, the hook size would depend on how think your plarn is, since it can vary. I would guess you would use any size from a UG G 4.00mm to a US K 6.5mm. Make a quick swatch to see if it looks good to you, and adjust your hook accordingly. Single crochets is just what was used in this project, probably it’s nice tight and small. But I’m sure you can make one with double crochet as well. We make these at our church. Some do sc and some use hdc. The hdc is what I used. Mine was 6′ long and I completed it in one week. We have a generous soul who cuts all the bags and her husband and another lady turned the strips into plarn so all I had to do was grab a large ball and start crocheting. I discovered that the thinner plastic worked more easily than the thicker plastic. Have fun! She used the SC so that it was a tighter mat for less airspace therefore being a warmer solid mass. Say if i use ww yarn and make the chain a lot longer i can make a small but long afghan and maybe a yoga mat!!! This is a terrific idea! And if you don’t have a homeless shelter to donate to there are lots of other things you can make like the ideas above. Also you can make mats for kindengarteners or daycare kids. You could make mats to lay on when you suntan outside (I don’t but others still do).I think it may have taken this lady a year to make her mat because it took that long for her to drink that much milk-lol! I love the idea of using the dry cleaning bags Darlene! Maybe if you can use a large hook and twist your bag as you go? Just a thought.I can’t wait to try this!! I’m going to put a little baking powder or talcum on my plarn and try to knit it through my Bulky Knit King. If I can do it and get enough plarn I could make lots of warm waterproof mats. There is trouble everywhere. Ms. Rita gets IT. This is such an awesome idea. Thank you for posting it. I have never heard of milk bags but will try to make one out of the bags that the store gives out. I also love the idea to make a kitchen rug. That I will start on first. Thank you for all the sharing. I watched a documentary about Haiti resently and I saw that they had a lot of plastic bags strewn about and I was wondering there was a charity or recycling plan for them to crochet plastic bags to help themselves? They buy and import things that as a crochetter I make with plastic bag yarn such as poofs/bean bags(but I fill with the parts of the plastic bags that I don’t use otherwise). I was just wandering because if they managed to recycle that as well the enviroment would be more looked after and they would not import what could be made by them. How do you clean the mats ??? Were could you send or donate the mats to. I plan on making some for my local animal humane society. I live in a Senior Community and our craft club is making mats also. Very stressful for some but so worth it.